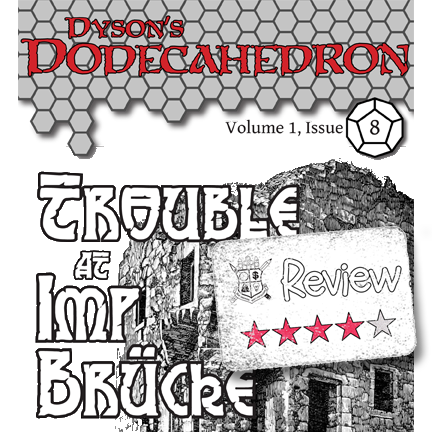 Yesterday Dyson Logos came out with Issue #8 of his "infrequently" published Zine Dyson's Dodecahedron. This particular issue is largely the adventure Trouble at Imp Brücke, set up for use with the Labyrinth Lord system. 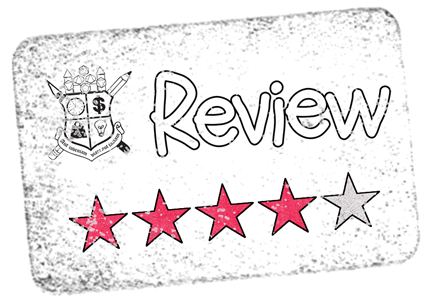 Before I go any further in this review I have a couple of author's biases that I must divulge. First is that I have never actually played Labyrinth Lord. My system of choice is HackMaster (the current edition) and I make no apologies for this. I know a lot of people are really digging the multitude of OSR games out there and Labyrinth Lord gets a lot of love from these folks. My second bias is that I have a bit of a GM Crush on Dyson Logos. I mean seriously, how could any "Old School" GM not love his map work? I'd pick up....heck I did pick up...all of the Dyson's Dodecahedron based just on the mapwork. The fact that he gives the maps out free and these Zines are "pay what you want".....awesomesauce. As I started going through this Zine I really didn't know what to expect. I was hoping for a bunch of maps, but beyond that not much. My initial flip through to get an overview showed only two maps. One was an expected dungeon map, but the other was a cool little overland map the likes of which I hadn't seen in a while. There were only a couple of other pieces of art, both of which added to the Zine. I hate when it looks like art has been added just to pad out the content. There is a single page at the end of random tables.....something I always enjoy, and then three more pages of open gaming license "stuff". I get really confused when I see so much license in a product because I know that all of the things listed weren't referenced in this product, as required by the OGL. If anything it looks like a continuation list of all the different products that have been published over the years, but I just don't know. The last thing I noticed, well actually it is the first thing, but the last thing I checked on, is the size of the Zine. It looked fine on my iPad, but the dimensions seemed a bit "off". I assumed that this was just because it was an A4 sheet and I'm used to the inferior letter size of 8.5" x 11". I was a bit surprised when I found that the Zine's dimensions were actually half of a letter page. This was a bit of a mixed blessing in and of itself because it made me want to print it out as a half-page booklet. When I realized the size of the page I also realized that the maps were also half-sized, as far as 300 DPI graphics went. My second pass was an actual read-through and the adventure was also a bit of a mixed blessing. It seemed on par with the other Labyrinth Lord adventures I've seen, but at the same time it just felt wrong to me. If you look at the extracted map above, it is reasonably close to a square mile, between 2 and 3 square kilometers for our metric friends. In that small space there are a lot of higher-end monsters. I wouldn't necessarily say they were apex predators, but I really couldn't see all of these monsters co-existing with a small human settlement within their feeding territory. A decent bit of this is explained away in the prelude to the adventure, but that only accounted for a small portion of this "imbalance" that mentally poked at me as I read this adventure. 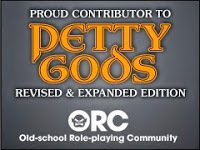 Of course I think that with a lot of OSR games you just have to roll with it and even within the confines of a fantasy setting things don't have to make sense. I'm perfectly willing to just chalk this up to a difference in GM styles, especially since I knew going in if I wanted to use this adventure I'd be having to change things up some. At that point I'm taken back to just the maps.....both of which were awesome. 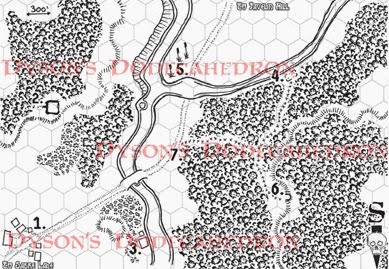 Since I know that Dyson makes these maps available for free on his website, I kind of wish that the Zine had direct links to hi-res versions of the maps so I could download them easily for my own use. Overall not a bad Zine. On the surface it really seems a bit of an overkill to buy this issue for a couple of half-sized hi-res maps I could otherwise find for free online, but Dyson's Dodecahedron is more than just a couple of maps. Even if you "need" to re-write the whole adventure to make it more appropriate to your game system, you realistically don't need to re-write the whole adventure. Just a couple of tweaks to the monsters and treasure, maybe minor tweak here or there to the story and you're good to go. I'm thinking it wouldn't take even 30 minutes to get Trouble at Imp Brücke ready for play at my table, which would save me a ton of time in game prep. Thank you and quite fair. I think I managed to explain why the high level goblins and the townfolk don't run into each other. As for what's in the tower, I'm at a loss to explain why they are still there without just sucking the whole town dry.